These photos are my entry for the weekly photo challenge: New Horizons. First, the east-west comparisons that older folks used to make. For example, someone would say, “This is the best Mexican food you will find east of the Mississippi.” I do not hear this used for comparing too much these days, but once in while I will use it in a convo. Second, I often think of Mark Twain – don’t some of you? For most people, the name “Mark Twain” is virtually synonymous with the life along the Mississippi River immortalized in the author’s writing. Clemens first signed his writing with the name in February 1863, as a newspaper reporter in Nevada. “Mark Twain” (meaning “Mark number two”) was a Mississippi River term: the second mark on the line that measured depth signified two fathoms, or twelve feet—safe depth for the steamboat. In 1857, at the age of twenty-one, he became a “cub” steamboat pilot. The Civil War ended that career four years later by halting all river traffic. Although Clemens never again lived in the Mississippi valley, he returned to the river in his writing throughout his life. And he visited a number of times, most notably in 1882 as he prepared to write Life on the Mississippi, his fullest and most autobiographical account of the region and its inhabitants, and again in 1902 when he made his final visit to the scenes of his childhood. Beautiful photos. I like Mark Twain. I knew the term but it always makes me wonder about traveling in a time where you measured depth with a rope to determine if it was safe to continue. Beautiful bridge and photos. I cross it everyday. oh lucky you! It is such a work of art! Fabulous pictures. Is this in St. Louis, MO? I used to study there but never realized there was such a beautiful bridge… Well I guess we too I 64 when we travelled east-west. 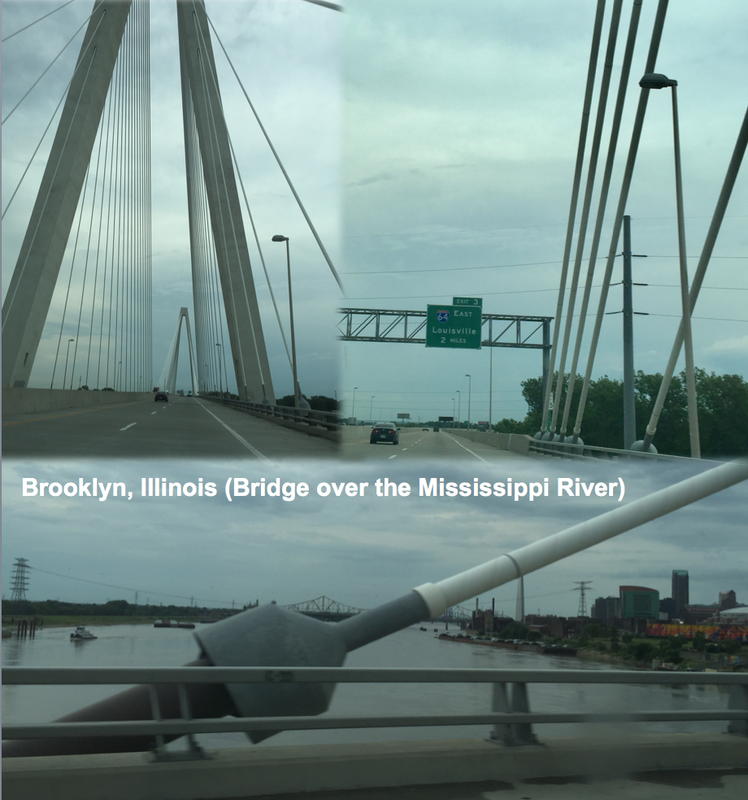 Hi tms, actually no, But I do have shots of a bridge near St Louis – crossing the Missouri River. and here is a collage I made with a few photos of this bridge to show you more. Great images! When I think of the Mississippi, I remember learning to spell the word — forwards and backwards — when I was really little. I have absolutely no idea why a child from Kirkcaldy, Scotland would need to be able to do that. The mind certainly is a weird thing. ha – well just so you know, every time I typed it in for this post – I hummed some kind of version of the recitation spelling…. so we have that in common – but you made me laugh because all Scots must love the gool ol’ Mississippi, Su! and do you ever count with the word inserted? Isn’t is such a weird thing for me to have done? I hadn’t thought of using it as a timing device for counting off seconds! I’m pretty sure it was my mum, when I was a preschooler. Hmmmm – let’s see- maybe s bit fluffy at times – but your posts are kept succinct and engaging – and the humor you weave in has originality and your voice. So I would not change a thing. Now recently I read some posts from a food blogger who overdid the adjectives – and at first it was fun. But by the third post I was worn out – and the person really would make good ads with her descriptive skills. It also seemed like she was playing with words and indulging in the use of rich adjectives to make her descriptions come alive. But I have not been able to go back and read more – verbosity can be heavy too. I love this review Y and thanks for the kind feedback too. Sometimes when I read those more verbose than I, it seems as though a thesaurus exploded on the page and landed in random pieces. I try to remind myself of that vision. Have a great night grandma Sue…. Thank you Jackie! Bridges are such scientific works of functional art – …. December 15, 2016 at ..
Well I hope so – if not – let’s connect before new year’s comes in….